Wearing monthly or weekly contact lenses is a great way to save money but, when you’re off on holiday, a bottle of solution can take up all-important luggage space. A travel size contact lens solution saves you some space and ensures that your lenses are safe and comfortable to use. 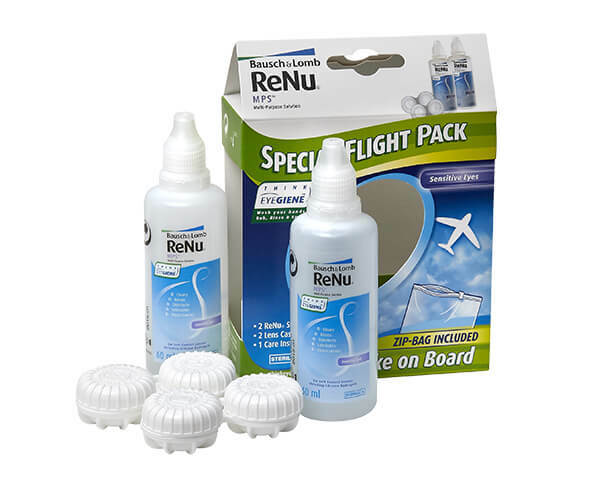 We stock a range of contact lens solution travel packs, including Renu MPS and Boston Simplus. What are contact lens solution travel packs and why are they important? Whether you wear hard, gas permeable or soft lenses, cleaning your monthly or weekly contacts with solution makes sure they’re safe to use and comfortable. The only problem is that solution bottles are often large and bulky, so if you’re off on a trip and luggage space is at a premium, it can be hard to squeeze in that all-important solution. 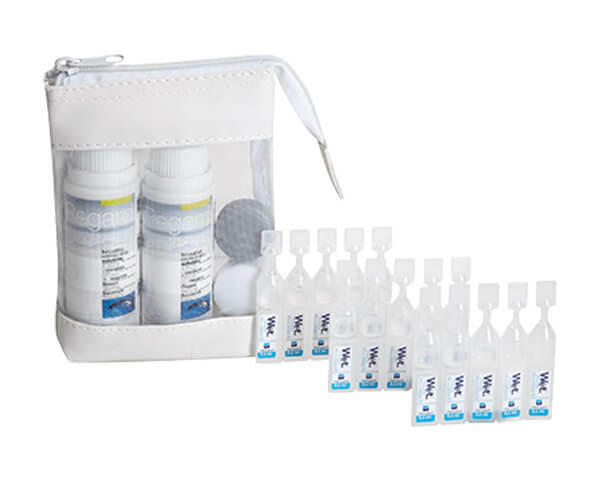 Contact lens solution travel packs are essentially smaller sizes of some of the most effective and popular solutions available. These perfectly portable bottles give you plenty of solution for a short holiday and often come in packs of 2 to make fitting them into your luggage nice and easy. A contact lens travel kit is perfect for trips away, fitting easily in your suitcase or backpack whether you’re flying, sailing or however you’re getting to your destination. What are the benefits of using contact lens solutions travel packs? With restrictions on how much liquid you can carry in your hand luggage on a plane, our travel packs are ideal for when you’re travelling light and don’t have a bag in the hold. These smaller quantities of solution will have your cleaning needs sorted for your whole time away, whether it’s for a weekend away or short business trip, without going over the limit. Perhaps the most useful thing about carrying a contact lens solution travel pack, is the ability to remove and store your lenses mid-flight. This means you can avoid wearing your contacts over the recommended time, which can lead to discomfort and irritation, and that your lenses are ready for you to use when you arrive at your destination. We advise picking up a travel-sized multi-purpose solution to cover all aspects of soft contact lens care in one handy bottle. These solutions can be used for cleaning, rinsing and storing both hydrogel and silicone hydrogel lenses, ensuring that your lenses are hygienic and comfortable to wear every day. This 2-pack of portable solutions makes travelling with monthly or weekly lenses super convenient. Coming from the optical experts at Bausch & Lomb, this all-in-one solution effectively cleans and cares for lenses and includes a clear, zip-up bag for easy transportation. The Opti-Free Puremoist Flight Pack, from Alcon, promises up to 16 hours of comfortable contact lens wear after storing your lenses. Using a patented HydraGlyde® Moisture Matrix technology, it cares for your contacts, leaving them feeling as comfortable at the end of the day as they did at the start. It also disinfects thoroughly, effectively removing germs as well as repelling dirt. 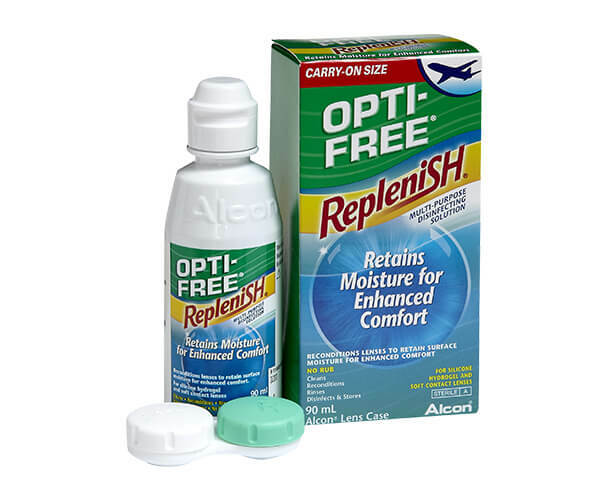 This handy, travel-sized version of Alcon’s popular cleaning solution is ideal for washing and storing your soft lenses. It uses TearGlyde technology to recondition your lenses, locking in a layer of moisture onto the surface of the lens to ensure that your eyes are comfortable all day. From Advanced Eyecare comes an ideal accessory for lens wearers on a short flight. Containing 2 bottles of preservative-free liquid, this pack will have you covered for up to 2 weeks of holiday and comes with rewetting vials and a useful case for carrying your contact lens essentials around. 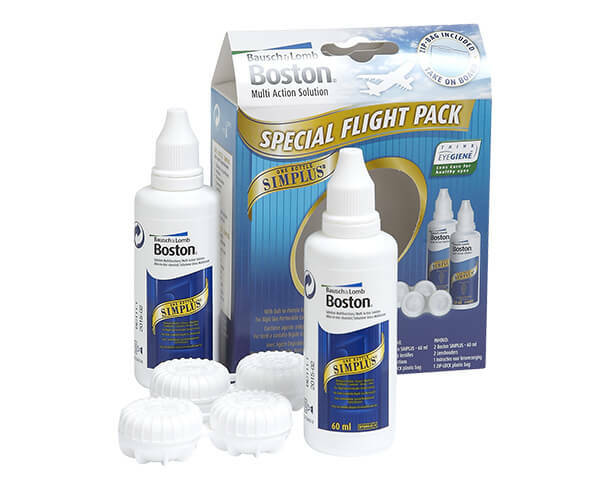 A handy travel-pack of all-in-one solution, from optical experts Bausch & Lomb, Boston Simplus is perfect for use during your flight and contains enough solution to last up to two weeks. If you wear gas permeable lenses, this solution is ideal for removing protein and dirt deposits from your lens surface.